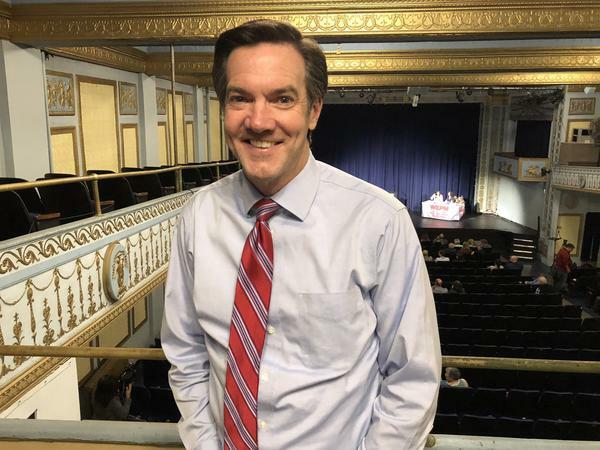 "I'm the only candidate that's actually working with Donald Trump every step of the way," said Evan Jenkins, a congressman from the third congressional district who's running for the senate. Congressman Evan Jenkins, running in the WV GOP Senate primary, says he doesn't want to see the country turn back from the progress it's making under President Trump. Patrick Morrisey, West Virginia's attorney general, is in a tight three-way race in the Senate Republican primary. Don Blankenship, left, talks to Patrick Morrisey, right, after a heated exchange at a campaign stop in Parkersburg, W.Va.
And to this day, the president remains well liked here. In fact, he's so popular that local Republicans are trying to align themselves with him, hoping his reputation will help them defeat incumbent Sen. Joe Manchin, D-W.Va, this fall. Although officially registered Democrats in West Virginia outnumber registered Republicans (a product of inertia and bygone family politics, as one analyst explained), in recent national and local elections, the state has swung strongly to the right. The red tilt has been so extreme and so swift that West Virginia Republicans looking to pick up a Senate seat this November assumed they had a distinct advantage in the midterms. And it was a logical assumption until a wildcard — Don Blankenship — joined the race jeopardizing their odds. Blankenship is the former CEO of Massey Energy who spent a year in federal prison for violating safety laws after an explosion at one of his mines killed 29 men. He's poured money and ads into the race that have helped him into a virtual three-way tie in the primary — and has quickly become the most-talked about candidate. In addition to Blankenship are Patrick Morrisey, the current state attorney general, and Evan Jenkins, a current congressman. The debate, in part, is about Trump credentials and Trump loyalty. "President Trump knows I've got his back," Jenkins said in an interview with NPR. "The president has come to my congressional district four times during his term of office, in just a little over a year." And, it's not just a political relationship, Jenkins suggests he has a personal rapport with the president. "He's invited me to the White House twice in the last couple of months to watch movies with him," he said. But Trump has not endorsed Jenkins or anyone else in the May 8 primary. He did invite some of the candidates to sit on the dais with him at an event in the state on tax policy earlier this month. Jenkins was sitting to his right, Morrisey to his left. Missing? Blankenship. Jenkins proudly talks about endorsing the president during the 2016 primary ahead of his opponents. In fact, even when it comes to justifying his own political conversion, Jenkins, a former Democrat, points to Trump. "Donald Trump once was a Democrat," he said. "I could not be a part of a party that put so many West Virginians out of work," he added, referencing the coal industry. Coal has been on the decline for years in West Virginia — in part, due to automation and, in part, due to an increased appetite for natural gas. But a lot of folks in West Virginia blame President Obama, national Democrats and environmental regulations for the loss of those mining jobs. Who has the real claim on Trumpism? Jenkins is the conventional choice. He even "looks the part," as one GOP operative explained. And, indeed, he combs his hair into the classic politician's side part. But, beyond appearances, he's also proven he can take on an entrenched Democrat. In 2014, he beat then-Congressman Nick Rahall, a 38-year incumbent. 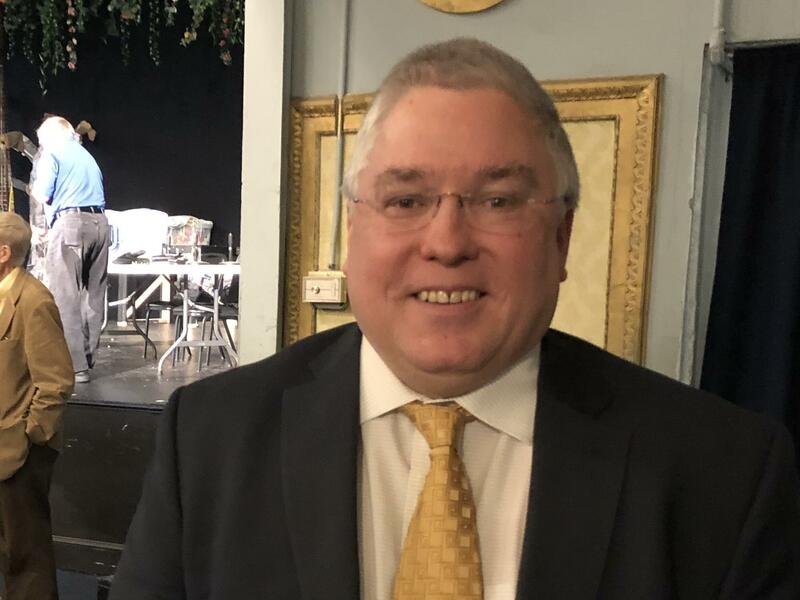 However, if Donald Trump is the true litmus test in this primary — the state's Attorney General Patrick Morrisey isn't going to let Jenkins cozy up to the president unchallenged. "I think it's important, someone who's worked with the president and has been able to help him on fighting against sanctuary cities, unlawful amnesty," Morrisey told NPR an interview. "We've stepped up, and we've helped him time after time." The attorney general is intense, kind of fiery and eager to throw a jab at his opponents. "Simply put, I am the only proven conservative running for the U.S. Senate," he likes to say at campaign stops. "We need to reinvent Washington. We need to blow it up, not just change it," he adds. Morrisey insists he would be a Trump ally in Washington, specifically helping to roll back "burdensome" regulations. But if voters want a candidate to "reinvent Washington" and roll back regulations, they have another, more unconventional option — Blankenship. Of all the candidates, he's the one who mentions Trump the least, but draws the most comparisons. He's a political outsider, a wealthy businessman and a polarizing politician. 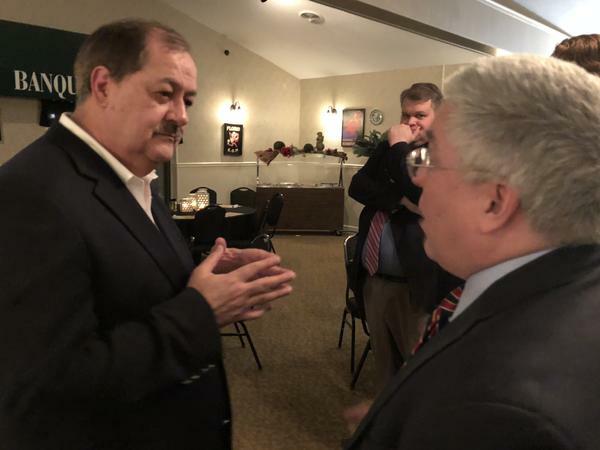 "You just can't get any more unconventional than Don Blankenship," said Bill Bissett, president of the Huntington Chamber of Commerce, which has endorsed both Jenkins and Manchin in the primaries. "He actually talks from the podium about spending a year in prison." Blankenship made headlines when he was the CEO of Massey Energy. He was a lightning rod then, but became even more controversial in the subsequent years as a convicted coal baron. He was released from federal prison last year. These days, on the campaign trail, he shows no remorse for what happened. Instead, he paints himself as a sort of political prisoner. "Obama put me in the Big House," he tells a crowd of Republicans at a county dinner in Parkersburg. "So I've had a different experience than anyone could possibly have." Despite his past, Blankenship is remarkably dry and methodical. On the stump, he talks about how he personally funded local Republicans across the state. "I spent a lot of money helping resurrect the Republican Party, conservatizing the courts and so forth," he said. "I've been instrumental in converting the West Virginia legislature to Republican control by putting a House of Delegate[s] member on every Republican ticket." He's eager to point out that some of his Republican rivals might not have political careers were it not for his donations that helped reinvigorate the GOP. And because of that financial support, even though the Washington establishment worries that Blankenship could be toxic in a general election, he has friends in an unexpected places in the local party infrastructure. He's also been working hard to clean up his reputation. Blankenship has spent over $1 million of his own fortune on TV and radio ads. And that goes a long way in West Virginia. That effort has helped pull him into a tight three-way race in the polls. He's also on a mission to visit every county in the state to meet with voters. Blankenship is subdued, yet zealous at the same time. His campaign did not respond to repeated requests for a formal interview. NPR was able to catch him on his way out the door after a candidate forum in Martinsburg. Blankenship initially said he doesn't "trust" NPR, and then tried to set the parameters. "You can ask me a question," he said. "You can't ask me about the explosion, 'cause I've answered that question for eight years now." NPR has done numerous stories about the explosion, its causes and on Blankenship's indictment, trial and conviction. He didn't want to talk about the explosion — and NPR was able to squeeze in just a couple of questions about the race before he left — but he was happy to chat about his proclaimed innocence, his prison punishment and why he's convinced it was unfair. "The judicial system failed," he said. Some analysts say Blankenship's campaign is a vendetta — a personal quest to clear his name. But, even if it began as payback, it's morphed into something much more — he has an intense desire to crush his opponents and win at all costs. "(Blankenship) is so ferocious," Bissett said. "It's very hard to counter-punch him." He's been running attack ads against both of his chief opponents, and they've been reluctant to punch back in public (or attack him directly about his prison record). A polarizing politician, jeopardizing the GOP's odds or both? People have a visceral reaction to Blankenship — some love him, others hate him. And though in style and temperament, he doesn't resemble the president, some voters say his he reminds them of Trump. "I think he reflects well with the values of West Virginia," said William Lemley, a 76-year-old voter in Wood County. "And I think he thinks an awful lot like Donald Trump, whom I deary love." But not everyone agrees. Gary Quarles, who lost his son in the Upper Big Branch mine disaster when Blankenship was CEO, said he, too, likes Trump, but Blankenship is no Trump. 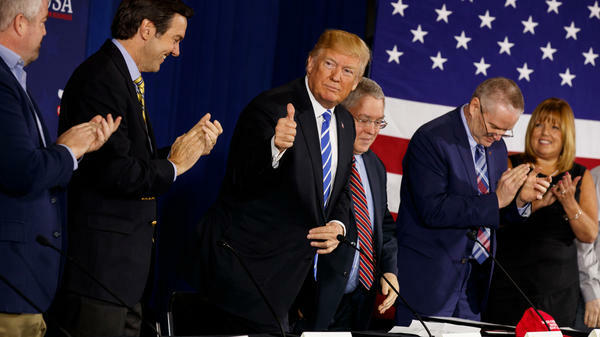 "I don't think he's even close to Donald Trump, being a man like Donald Trump," said Quarles on the day of the eight-year anniversary of the mine explosion. "We want Don Blankenship to shut up and leave and leave us alone," he added. "I'd like to see him just drop out." The former coal executive is sucking up a lot of airtime and attention. And that's frustrated Quarles, who held a press conference at the Upper Big Branch memorial in Boone County to speak out against Blankenship's bid. Blankenship is such a wildcard, though, he's confounded even his opponents. Morrisey criticizes him for what he sees as buying his way into the race, while Jenkins suggests Blankenship's whole campaign is nothing more than an image resuscitation tour. "Don Blankenship is out for Don Blankenship," Jenkins said. "This is a vendetta to try to seek revenge for his criminal prosecution." But whatever the reason for Blankenship's bid, he's turned this West Virginia primary upside down. "It would be easier [for Manchin] to beat Blakenship in a statewide race," said John Kilwein, a political science professor at West Virginia University. "He's a convicted coal chief. I mean people died as a result of his negligence." Washington Republicans certainly agree and worry about the challenges Blankenship would present in a general election if he were to pull off the primary win. The Charleston Gazette-Mail reports that a superPAC with ties to national Republicans purchased airtime to run "anti-Blankenship" ads. It's a sign of how worried the GOP establishment is about a Blankenship victory — and the possibility that it could hand a race to the Democrats in the heart of Trump country. President Trump's unpopularity is seen as a liability for Republicans in this year's elections but not in West Virginia. He remains so popular there that Republicans in the state are tying themselves to Trump, hoping his reputation will help them defeat Democratic Senator Joe Manchin this fall. And shaking up the Republican primary is the former CEO of Massey Energy, who spent a year in prison. NPR political correspondent Asma Khalid reports. ASMA KHALID, BYLINE: Republicans are confident they've got the home court advantage here. In the 2016 election, West Virginia supported the president more than any other state. Trump got 69 percent of the vote. And so in this year's GOP Senate primary, the fight is kind of about your Trump credentials. 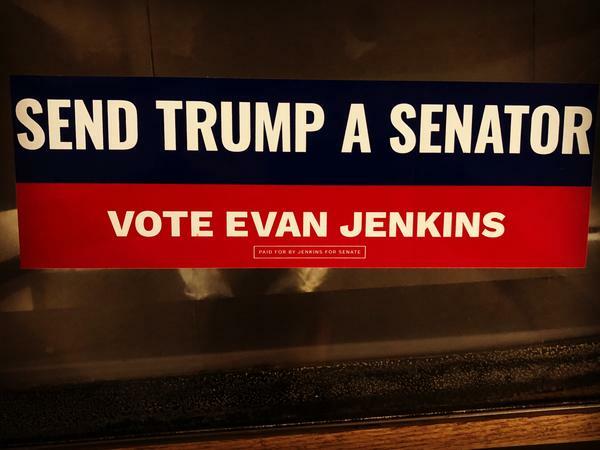 EVAN JENKINS: I'm the only candidate that actually endorsed President Trump in the May 2016 West Virginia primary. KHALID: That's Congressman Evan Jenkins. He's 1 of 6 Republicans vying for the Senate seat in next month's primary. JENKINS: The president has come to my congressional district four times during his term of office in just a little over a year. KHALID: Jenkins used to be a Democrat. But even when it comes to his political conversion, he points to Trump as his role model. JENKINS: Donald Trump once was a Democrat. I could not be a part of a party that put so many West Virginians out of work. KHALID: Jenkins is talking about the coal industry. It's been declining for years, but a lot of folks here blame President Obama and the Democrats for the loss of those mining jobs. In this Senate primary, there are half a dozen men running, but really the race comes down to three. Jenkins is the conventional choice, the one the local Chamber of Commerce endorses, the one who combs his hair into a classic politician side part. But it's the state's attorney general, Patrick Morrisey, who thinks he's got the real claim on Trumpism. PATRICK MORRISEY: I think it's important, someone who's worked with the president and has been able to help him on - fight against sanctuary cities and unlawful amnesty. And we stepped up. And we've helped him time after time. KHALID: Morrisey's intense, kind of fiery. MORRISEY: We need to reinvent Washington. We need to blow it up, not just change it, so we can reinvent it. KHALID: But if voters want an unconventional candidate, then they could look to Don Blankenship. If that name rings a bell, it's because he's a convicted coal baron who made headlines as the former CEO of Massey Energy. He spent a year in federal prison for violating safety laws after an explosion at one of his mines killed 29 men. For that, he shows no remorse, and instead he paints himself as the victim, a sort of political prisoner. DON BLANKENSHIP: Obama put me in the big house. So I've had a different experience than anyone possibly could've had. KHALID: After a campaign stop, I try to catch Blankenship on his way out the door. At first he tells me he doesn't trust NPR. Then he tries to set the parameters. BLANKENSHIP: You can ask me a question. You can't ask me about the explosion because I've answered that question for eight years now. KHALID: I squeeze in a couple questions about the race before he leaves. Blankenship is dry and methodical on the stump. He talks about how he personally funded local Republicans across the state. BLANKENSHIP: I've spent a lot of money helping resurrect the Republican Party, conservatizing the courts and so forth. KHALID: Blankenship is subdued but zealous with a desire to crush his opponents and win at all costs. In fact, he's spent more than a million dollars of his own fortune on ads. And that's pulled him into a tight three-way race in the polls. William Lemley, a voter in his 70s, is leaning toward Blankenship. WILLIAM LEMLEY: I think he reflects well with the values of West Virginia. And I think he thinks an awful lot like Donald Trump, whom I dearly love. KHALID: Of all the candidates, Blankenship is the one who mentions Donald Trump the least but draws the most comparisons. The thing is, with voters here, some love him, and others hate him. GARY QUARLES: We want Don Blankenship to shut up and leave us alone. KHALID: That's Gary Quarles. When we meet, it happens to be eight years to the day he lost his son in that mine explosion. And he blames Blankenship. He says he likes Trump, but Blankenship is no Trump. In fact, he's such a wildcard, he confounds even his opponents. Morrisey criticizes him for buying his way into this race. MORRISEY: It's easy to pop your numbers up when you're the only one on television. KHALID: Jenkins says Blankenship's just looking for payback. JENKINS: Don Blankenship is out for Don Blankenship. This is a vendetta to try to seek revenge for his criminal prosecution. KHALID: But it doesn't matter why Blankenship is running. Whatever the reason, he's turned this West Virginia primary upside down. He has Washington Republicans worried that in the heart of Trump country they could hand the race to the Democrats. Asma Khalid, NPR News. Transcript provided by NPR, Copyright NPR.